"What? No Lowell George?! No Paul Barrere?! Blasphemy! Shame on you, Strat-O-Blogster!" Thanks Colin for setting me straight!! Besides Duane, Ry, Lindley, Trucks, Landreth & Kottke-- LOWELL GEORGE will forever live as a Supreme Sultan of Slide! Lowell was also a very cool singer and songwriter. Little Feat lives on, but I'm partial to the Lowell George era stuff, and proudly own all of it on vinyl, including the live "Waiting for Columbus" and Lowell's solo album "Thanks I'll Eat it Here". Current Feat doesn't have that low stagger and creep groovitude. How's that for ya Colin! Lowell belatedly Joins our Strat-O-Bro' directory. Although Lowell hailed from Burbank, CA (like Bonnie Raitt), he had a New Orleans beingness. Little Feat material spanned roots, blues, country, rock and jazz fusion. The "Time Loves a Hero" album was a real fusion trip featuring Michael McDonald on backing vocals-- about the same time McDonald was doing those duties for Steely Dan. The "Down on the Farm" LP included guitar sections by Robben Ford. One theory of mine (of many), is that if Becker & Fagan were from New Orleans, the Dan might've sounded like the Feat. Robert Plant's "Shaken & Stirred" solo release featured Feat drummer Ritchie Hayward really stepping out into Bill Bruford meets Stewart Copeland territory. Bonnie Raitt got her slide style hangin' out with Lowell. So Little Feat's eclectism pervades the music culture much like The Allmans, The Dead, The Dan and Zappa. My favorite album is probably "Feats Don't Fail Me Now" because of it's low stagger and creep groovitude (my description & I'm usin' hell out of it!). Our featured clip "Cold-Cold-Cold" is from that album. 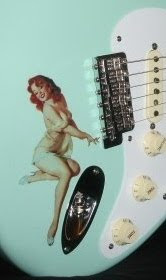 Check out the odd jack plate on Lowell's Strat. My favorite fantasy beer commercial would feature the opening of this tune as a sound byte over a bubbly beer pouring close-up scene. But that's just me... I don't dig silver bullet trains and bullfrogs in beer ads.